DOES STARK RETIRE? DOES OPEN PRIMARY COME INTO PLAY? DOES RACE BECOME FREE-FOR-ALL FOR A SLEW OF CANDIDATES? Proposed congressional districts proposed Friday. Long-time Rep. Pete Stark could face a fellow incumbent Democrat for congress next year, if a proposed first draft of the Citizens’ Redistriciting Commission hold true to form. Stark’s 13th District may be cobbled together with Rep. Jerry McNerney’s 18th District, according to the maps released Friday afternoon. 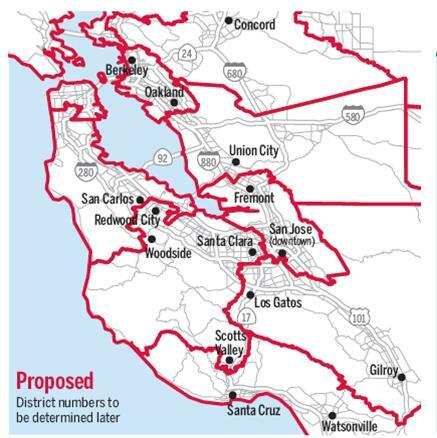 The district would stay true to Alameda County’s east boundaries and swallow the Tri-Valley area, Hayward, San Leandro and parts of Fremont. The proposed district lines is one of 14 congressional districts including two or more incumbents. Alameda County’s potential race could feature enormously complex and riveting questions over the next year. Stark, the 19-time incumbent from the East Bay is nearing 80. His health has deteriorated over the past few years starting with a long bout with pneumonia in 2009 that sapped him of much of his energy, so much so that only a few lawmakers missed more votes on Capitol Hill than Stark. Nevertheless, the liberal lion’s seat has been nearly a lock for three decades. An opponent has not garnered more than 30 percent of the vote since 1980, but a string of angry town halls two years ago featuring raving Tea Party members might serve as a reminder that somewhat more conservative voters inland might direct huge amounts of vitriol against Stark. If Stark’s seat has never been contested since President Jimmy Carter was in the White House, McNerney’s district has consistently been up-for-grabs since he narrowly beat Republican Richard Pombo in 2007. In fact, many pundits zeroed in on McNerney’s seat as the one Bay Area district likely to be rejiggered. Another angle to be explored during the next election cycle is another state ballot initiative allowing for open primaries, which can allow members of the same party to face-off in the general election. In such a match up, Stark would appear to be a cinch for win re-election. Unfortunately, it’s not that simple, since there is an unofficial line of local politicians unabashedly coveting Stark’s seat. Senate Majority Leader Ellen Corbett is one, as is Assemblywoman Mary Hayashi. Some may make the calculation that “the more, the merrier” might make this super race a toss-up. To make things simple, Stark may just decide to hang them up after 38 years in Washington. After a recent town hall, Stark, sounding contrite, said he is awaiting the results of the commission’s maps to make a decision. Some believe with his legacy secure with the passing of health care reform last year, there is little Stark has to prove and may not be up for the dogfight likely to ensue. Posted in congress, Ellen Corbett, Jerry McNerney, Mary Hayashi, Pete Stark, redistricting, Uncategorized. Bookmark the permalink.